This post is written in collaboration with the Fair Food Forager. A movement which aims to change the way the world eats by making ethical easy. I'm excited to team up with these guys. They deliver such a great message with complete positivity. I firmly believe there are a lot of folk (including myself) out there who want to make better choices but just don't know where to start, after all, we are awash with information all around us. The Fair Food Forager website and app make it easy to find ethical and sustainable food through their location-based service. The app is free to download. Read more about their mission here. I should really introduce this recipe by giving credit to the humble sprout, as it's definitely managed to find its cool somehow in recent years. Especially for any Instagrammer! This pleases me a lot, it's such a tasty and important part of Christmas dinner IMHO and I have to say as soon they come into season each year I look forward to eating them in all sorts of yummy ways (believe me, in a frittata with cheese and chorizo is pretty amazing, perhaps that's another one for the blog🤔). Feelings of nostalgia sweep over me as I cook and smell that familiar Christmassy sprout smell. Do you do that with food? Some smells and tastes will always transport me back, not always in a good way, but definitely funny😉. I can't help but remember that god-awful sweaty and almost cheesy flavour of sprouts from my youth. What the hell was all that with boiling the life out of veg? Sorry, Mum! Yeuch! Roasting the sprouts is a total game changer. You'll notice a whole new level of character, I'm sure of it, and the crispy outer leaves are honestly just sublime. If you served me this plateful for dinner I'd be happy and satisfied (maybe not on Christmas day though, I’m not missing out on the rest of the food on the 25th!). Blitz 1 preserved lemon, garlic, olive oil and black pepper together in a min blender until smooth. Mix the wet mixture together with the brussels sprouts in a bowl so they are fully coated. Arrange the sprouts on a baking tray, give them as much space as you can, roast for 20-25mins at 160c or until cooked. They should still have some bite and the exterior shells will have browned. Scatter with parsley, pumpkin seeds and lemon zest. Season if you wish. I cook these at 160c as they're only small and the leaves could easily burn. Make sure to move them around a couple of times during cooking and if they look dry spray with a little oil. 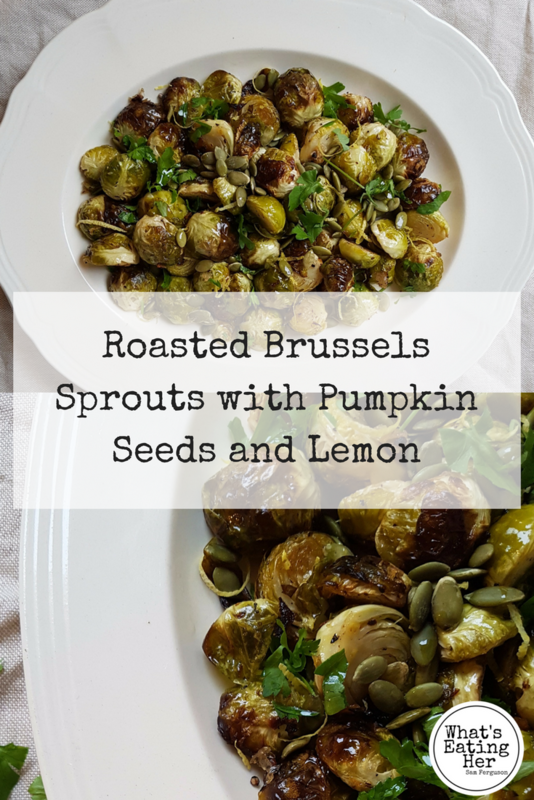 The preserved lemon is the secret to the distinct flavour in this recipe; it works beautifully with the sprouts. I use Belazu lemons. The juice of a lemon mixed in with the oil would work equally well. My other little trick is I like the pumpkin seeds toasted, but I'd rather not add another stage of cooking into the recipe, if you want to though you can sprinkle them onto the sprouts about 5 mins before you remove them from the oven, make sure they get a bit of a coating with oil for the perfectly toasted nutty flavour. So, that's this year's sprouts sorted. I'll no doubt try out some other recipes before the big day as I can't resist these seasonal beauties. What do you think, would you give them a try? I'd love to hear your interesting seasonal recipes. Send them my way.